If we can lower the perception of high fire risk on tall mass timber maybe it will lower the risk management premiums to make the renewable sustainable movement get a deeper grip on the US Markets. M-Fire Suppression CLT Fire Resistant Applied Science is now available to builders that want to add to the E119 fire engineering currently being use on CLT Mass Timber. Disappointing news has come out of the wood work this week: plans for the tallest timber building in North America have been shelved. 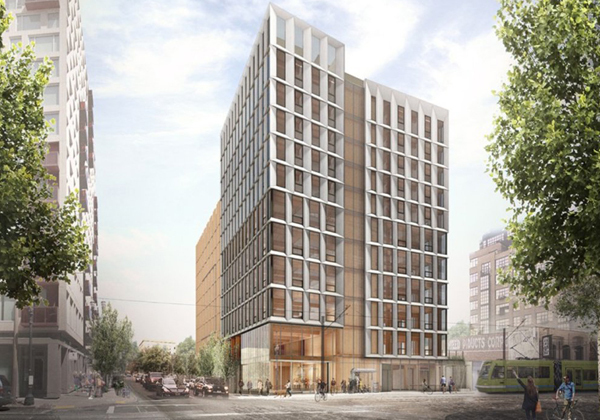 Framework, a 12-story structure planned for downtown Portland, Oregon, designed by LEVER Architecture, was set to begin construction after receiving a building permit and a $6 million investment from the City of Portland to include 60 units of affordable housing. The developer said, "inflation, escalating construction costs, and fluctuations in the tax credit market are to blame for the sudden hold". Despite massive investment, the project still had not met it’s $29 million fundraising goal as of Monday. The tower was on track to break records as the largest single use of Cross-Laminated Timber (CLT) in the U.S., and would have set an example for possibilities in timber structures. It would surpass the already-built Carbon12, an eight-story, mass timber building also in Portland. The research and planning that went into crafting the design for Framework were considered by many to be revolutionary in the field. Anyeley Hallova, a developer with the project, acknowledged the extensive work and collaboration the Framework team has undertaken with both private entities and public agencies since the design process began in 2014. “Although beset with market challenges beyond our control, we are very proud of Framework’s achievements and the new standards we’ve established for the use of CLT in the U.S.,” Hallova said in a statement.